Join us for Acts: The Spread of the Kingdom at Nativity in the Nazareth Room beginning Sunday, January 7 at 1:00 pm and continuing Sundays. For more information or to register for the study, call Chris at 232-2414 or via email: Chriss@nativitycatholicchurch.net. Please register on or before December 17 so we can order workbooks. 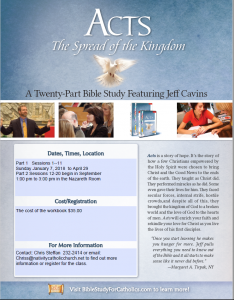 The first sessions of this study created by Jeff Cavins will run from January 7 to April 22. The second group of sessions will start September 16 and run through November 18.